Richard Gordon, the pioneer of Quantum Touch, traveled to Edgar Cayce's Association for Research and Enlightenment (ARE) in Virginia Beach, VA to present information on Quantum-Touch on Sunday, September 14th. 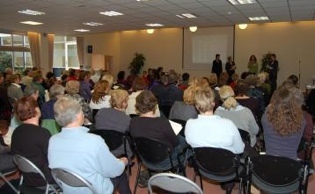 His lively, interactive workshop was very well received by a ready, willing and, as it turns out, more than able audience of over 100 people who were attending the A.R.E. Conference on Medical Intuition Training. Most of the audience was already involved in the holistic healing field including massage therapists, chiropractors, Reike practitioners, hypnotherapists, acupuncturists, and herbalists. Few, however, were familiar with Quantum-Touch. Richard used his wit and wisdom to describe the power of Quantum-Touch and the simple techniques used for this amazing modality. What followed were plenty of "ah, ha" moments as the loving energy in the room escalated and the participants actually began to feel and see their own bones move, and feel their pain move and finally disappear. Richard also shared his excitement about the future possibilities of Quantum-Touch and the responsibility that each of us has as healers of ourselves, each other and planet Earth. Virginia Beach Quantum-Touch practitioners and instructors, Laulie McGovern and Linda Jewell were on hand (pardon the pun) to assist Richard with the exciting experiential part of the workshop. He will be presenting in Richmond, Virginia in October. Try not to miss it.